Coppa Italia winners list – Coppa Italia is annual cup competitions that involved clubs in Italy. This competitions served as primary knock-out cup in Italy and secondary competition beside Serie A. To date, Juventus is the most succesful clubs in Coppa Italia with 12 times being champions. Other traditional teams in Italy such AC Milan, AS Roma, Inter Milan and Lazio also several times become Coppa Italia winners. So what’s other teams that included in list of Coppa Italia winners from beginning to date? The first Coppa Italia edition was held in 1922, but the second tournament held again in 1936. This competitions enter hiatus period from 1943 to 1957 and after that held annually. Vado was the first Coppa Italia winners back then in 1922, while Juventus become the holders after become Coppa Italia winners 2016-17. The winners of Coppa Italia qualify to UEFA Europa League. Coppa Italia contested by Italian club in several hierarchy in Italy, such Serie A, Serie B and Lega Pro. Serie A dominated this competitions and almost guarantee the champions list every year, giving their strength and squad depth rather than clubs in below competitions like Serie B or even Lega Pro. 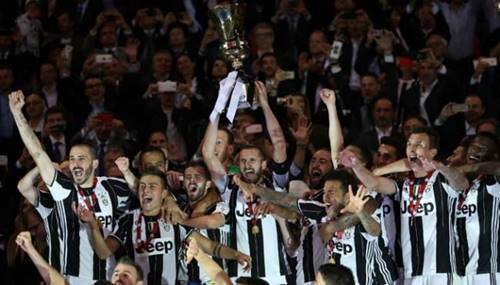 Juventus also recognised as the most succesful clubs in Coppa Italia, having won 12 out of 17 finals. I Bianconeri also become the most champions club in Serie A and most domestic trophy in Italy. AS Roma is the next best teams in this competitions with 9 champions and Inter Milan claim third spot with 7 winners. Other big club in Italy such Fiorentina (6), Lazio (6), AC Milan (5) and Napoli (5) also several times won Coppa Italia from years to years. So what’s other club that join in the list of Coppa Italia winners each year from beginning to date. Here are complete table of Coppa Italia winners list and most succesful clubs in Coppa Italia history. That is the table list of Coppa Italia winners to date with Juventus crowned as recent Coppa Italia champions 2016-2017. Juventus also become the most trophies won by club in Coppa Italia with 12 times as champions, followed by AS Roma (9) and Inter Milan (7).